Businesses worldwide, are experiencing a common phenomenon - increasing change, uncertainty and unpredictability in the business environment. And the situation is not going to get any better - in fact it's going to get worse. Large uncertainties and unpredictability are fast becoming the norms of everyday life. Businesses don't like surprises. And they don't like surprises because surprises can be dangerous. Unexpected changes can harm a business because enterprises are fragile - they are easily damaged and broken by unexpected and unpredictable changes and events. How can we deal with this problem? We can solve it by building an enterprise that is not easily damaged and broken by unexpected and unpredictable changes and events. An enterprise that is agile to rapidly adapt to tomorrow's surprises. It is not easy to create such an enterprise because it requires the development of a whole new set of business practices as well as radical changes across the whole enterprise. Note that agility is not just about speed of response - it is about rapid adaptation. In other words, enterprise elements adapting in response to unexpected and unpredictable changes and events, new opportunities and customer requirements, new technologies and changes to industry structures. What is an Agile Enterprise? An agile enterprise is a fast moving, adaptable and robust business. It is capable of rapid adaptation in response to unexpected and unpredicted changes and events, market opportunities, and customer requirements. Such a business is founded on processes and structures that facilitate speed, adaptation and robustness and that deliver a coordinated enterprise that is capable of achieving competitive performance in a highly dynamic and unpredictable business environment. How do we build Agile Enterprises? It requires strategic vision to commit to embracing the emerging business environment. This involves creating an agile strategy that manifests principles of adaptation across the value chain. An enterprise's agility drastically reduces if only part of the value chain is agile, hence, an Agile Enterprise needs an Agile Governance to drive Agility across the organization. Purpose of this governance is not to control. Its main function is to ensure alignment of agile execution with agile strategy. It also takes responsibility of investing in team's agility. This agile governance needs to be very "lightweight" to justify agility of the process. In this article we will focus on how to create an Agile Governance as a building block for an Agile Enterprise. How can we create lightweight Agile governance without compromising Agility? 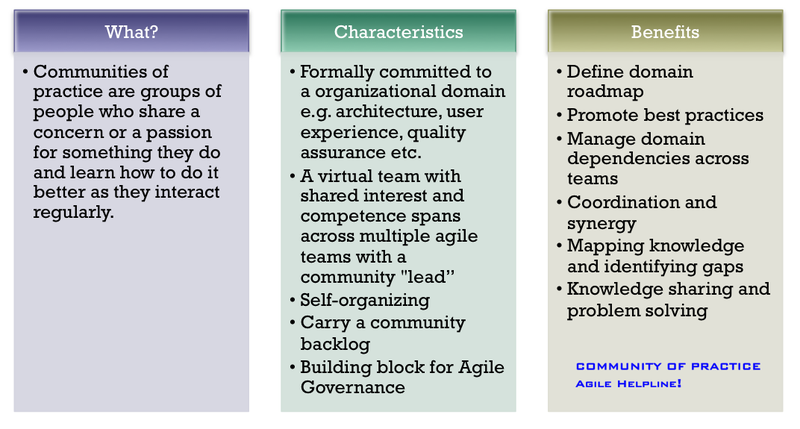 I highly recommend you to review these concepts because these are the backbone of the Agile Governance. Communities of practice (CoP) are groups of people who share a concern or a passion for something they do and learn how to do it better as they interact regularly. What are the characteristics of CoPs? Formally committed to an organizational domain e.g. architecture, user experience, quality assurance etc. What are the benefits of CoPs? Finally, how does these CoPs help in Agile governance? Ensure that folks in these functional domains are cross-functional and hands-on while maintaining their area of expertise. Convert your dedicated domain teams into virtual teams and make these domain specific folks part of the agile teams focusing on specific business capability. Each Agile team has people capable of software design, UI design, QA etc. 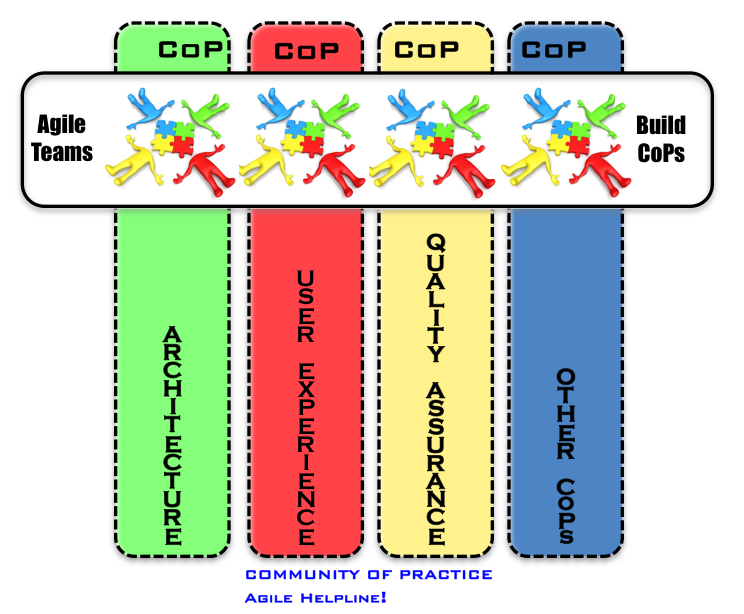 In other words, create virtual CoPs who virtually maintain their domain specific backlog while each member of this CoP becomes part of some Agile team. 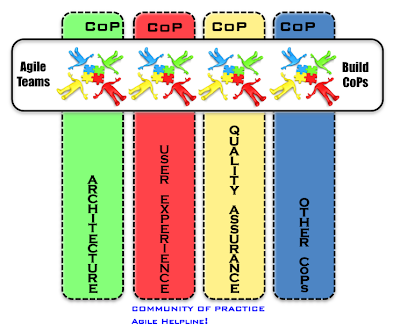 Each CoP has a lead who functions more like a domain product owner. These CoPs must be self-organizing. So far so good, we solved the problem of creating silos while developing cross-functional agile teams, however, we also introduced a new dimension by team virtualization. How do we ensure that these virtual teams are functioning well? How can we make these virtual teams more scalable? 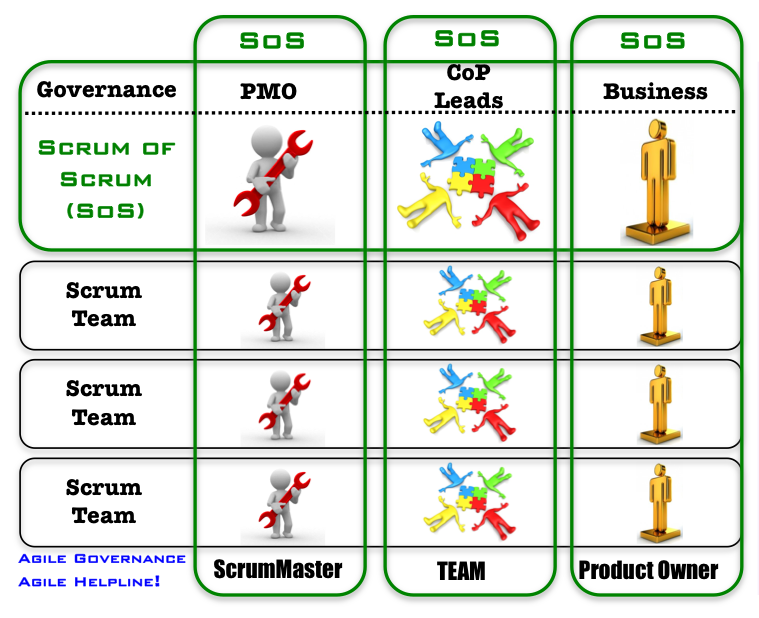 Let's introduce another concept called Scrum of Scrum (SoS), which helps in making Agile Governance scalable. 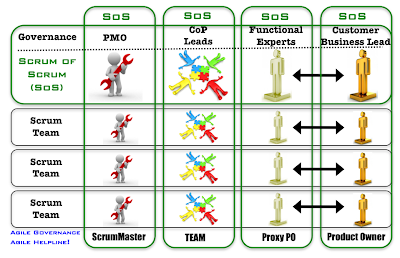 SoS is introduced by Scrum but you can apply this concept in any Agile format. 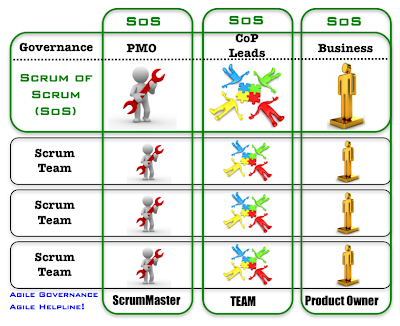 The scrum of scrums (SoS) is an important technique in scaling Scrum to large project teams. This concept allows clusters of teams to discuss their work, focusing especially on areas of overlap and integration. 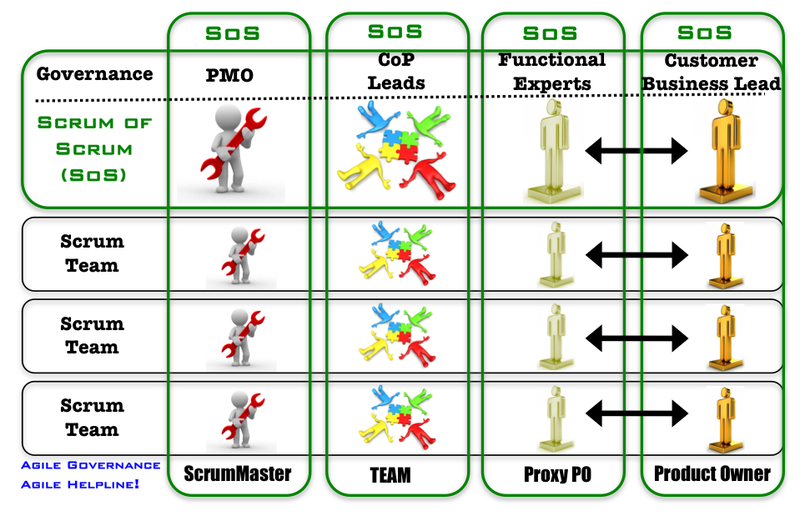 SoS creates an virtual environment to members of various Scrum teams to function as Scrum of Scrum. As you will notice in the following diagram, you can implement SoS horizontally for the Agile Governance and Vertically for the CoPs. This approach makes CoPs more effective and CoP leaders make Agile governance highly effective. If you need to extend this governance further in a highly distributed environment or to an contracting environment, then you may apply another concept called "Proxy Product Owners". Simply speaking, if main Product Owner cannot participate actively in your agile teams then you may assign a Proxy who represents Product Owner in the Agile team. This proxy needs to maintain a very good communication with the Product owner. There are pros and cons for this concept, hence, it needs to be applied carefully. 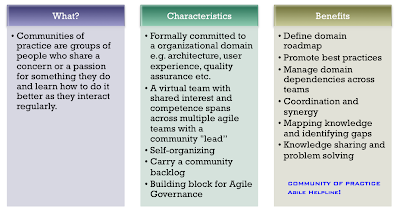 In a nutshell, Agile Governance is based on following three basic concepts. It is not mandatory that all 3 are required to be implemented. It largely depends on the complexity of your project and organization. Ultimate objective of the Agile governance is to make Agile process more scalable without loosing focus on integration and strategy of the enterprise.